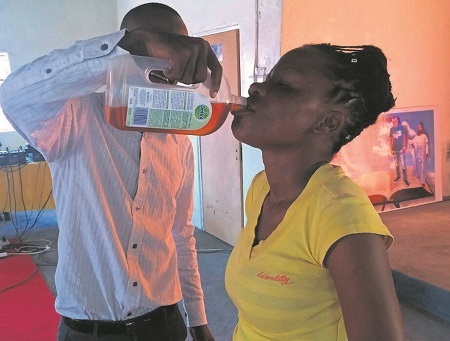 You would recall the news of this Pastor last week, Prophet Rufus Phala of AK Spiritual Christian Church in Makgodu, Limpopo, stunned people with his unusual healing methods when he made his church members drink Dettol. Prophet Rufus who had made his church members drink Dettol during Sunday service, reportedly promised them that they will be healed of their sickness if they drink the antiseptic liquid. “I know Dettol is harmful, but God instructed me to use it. I was the first one to drink it,” he had claimed, adding that the Holy Spirit had instructed him to use the product. 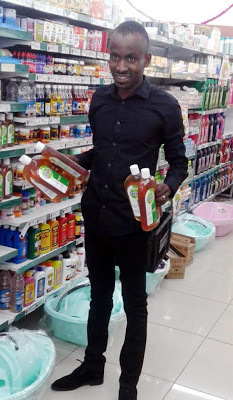 Despite a statement by Dettol South Africa, condemning Prophet Rufus Phala for forcing members of his church to drink the liquid antiseptic, he was spotted at a local supermarket buying more bottles of the product. Dettol company warned the prophet to stop the practice because oral consumption of its product can endanger health. “After last week’s service I have been receiving amazing testimony from members of my church,” he claimed.